Aga Khan visits Toronto - 2010-06-02 | Ismaili.NET - Heritage F.I.E.L.D. 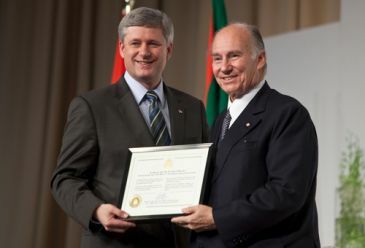 Prime Minister Stephen Harper last week conferred honorary citizenship on the Aga Khan, the spiritual leader of the Shia Ismaili Muslim community. The Aga Khan was in the city last week to mark the groundbreaking for the first museum of Islamic art and culture in North America, an Ismaili centre and park. There are more than 30,000 Ismailis in Toronto alone.